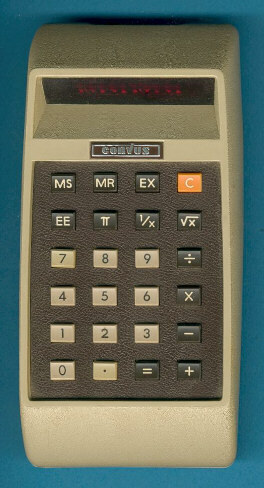 Corvus, the consumer division of the famous IC manufacturer MOSTEK, introduced with the Model 411 a basic four-function calculator with full memory, PI, 1/x, and sqr(x) keys. Main difference to the Corvus 310 and Corvus 320 is the added 6th row of keys we know already from the Corvus 415. The printed circuit board (PCB) of the Corvus 411 makes use of the MK50310N single-chip calculator circuit. Learn more about Mostek Calculator Integrated Circuits. The Corvus 400 uses in contrast to these models a different housing. Other calculators sold under the Corvus brand are the 500 and 615 models. Don't miss the Magiclick 450, a perfect doublet of the Corvus calculator using a brain manufactured by Rockwell. © Joerg Woerner, October 17, 2002. No reprints without written permission.